Wear the Spirit of Gary Nixon with New Speed & Strength Gear! Gary Nixon, Motorcycle Hall-of-Famer, started racing at a very young age and quickly became the best at almost every form of riding. Back in the day, racers would do everything: road race, dirt track, touring, drag racing, etc. In 1963 he won his first AMA National road race, and by 1967 and 1968 he was AMA Grand National Champion -- the best at five types of motorcycle racing. Gary was also known to be tough as nails for riding even when injured. Due to the lack of technological advancements in protection, injures were frequent. To keep it in perspective, there were no race suits with air bags. There were no neck braces. Snell was not in existence. CE ratings on body armor were not even a thought. Body armor? What’s that? Safety meant hay bales at tight corners. 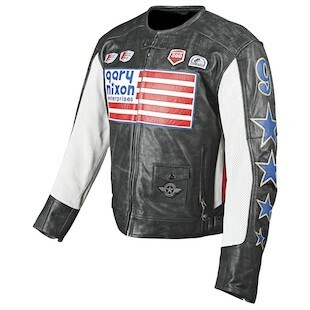 The Speed & Strength Gary Nixon collection pays homage through a retro-themed jacket and helmet. The vintage leather jacket will have the late 60’s look with 2014 protection and comfort. With stars down the arms and stripes through the chest, Gary’s patriotic colors come alive. His recognizable number 9 across the back of the Speed & Strength Gary Nixon Leather Jacket will let fellow fans pick you out from the crowd, and will surely be a piece of conversation. The jacket features 1.2 to 1.4mm cowhide and removable C.E. rated shoulder, elbow and back armor for protection. For comfort, it includes waist adjustment, perforation under the arms and a low collar. It also features reflective trim for visibility and belt loops so you don't drop your pants on a slide. There will also be a matching ¾ DOT-rated SS600 helmet with the flag on one side and his number on the other. 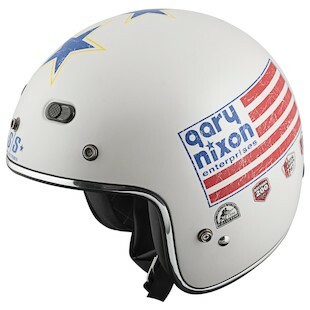 The Speed & Strength SS600 Gary Nixon Helmet compliments any racing patriot. Gary was known to be a great guy and his no-B.S. racing style was leveraged by his irreverent sense of humor and genuine personality. Now we can continue to honor and remember Gary as he truly deserves.